Despite indications I may sometimes give to the contrary (e.g. with jovial references to “token salad” when helping myself to a minimal bit of vegetable matter as part of a well-piled plate of food at a buffet), I actually quite enjoy eating salads. However, it is rare for them to make up the bulk of a meal for me. I had been to the supermarket and picked up a couple of little gem lettuces and some salad tomatoes as part of a special offer on fruit and veg, along with a fresh pineapple. My plan all along was to make them into salad as part of my dinner. However, due to a sequence of events including an impromptu beach trip with some friends in the evening, I didn’t actually get round to eating much more than a few handfuls of Bombay Mix until I got home shortly before 11pm. By this time I was fairly hungry and wanted something quick to prepare and not too heavy to eat before I went to bed. A few minutes later, I had two delicious salads prepared which I then proceded to eat with a few slices of fresh bread. I remember reading, several years ago, advice from a cookery guru (I think it was Nigella Lawson, though I’m not entirely sure) that you shouldn’t mix red and green in a salad. Although I’ve enjoyed enough mixed salads to be firmly convinced that this advice can be safely ignored, I decided on this occasion to make two separate salads – one featuring the lettuce and the other the tomatoes. My first salad was a version of my default salad, namely some torn-up lettuce leaves and various other ingredients tossed around in a DIY vinaigrette dressing. On this occasion, the other ingredients were a couple of chopped spring onions, a few capers and a handful of bisected green olives. The vinaigrette was a simple mixture of a fairly generous quantity of olive oil and a somewhat smaller amount of balsamic vinegar, seasoned with a bit of salt, pepper and rosemary and whipped up a bit with a hand whisk. The other salad was a bit more experimental, although based fairly closely on my recollection of salads I’ve been served by other people. I sliced up a couple of tomatoes and put them in a bowl, then sprinkled them with black pepper (freshly-milled, of course – Delia would be proud of me), dried basil, crumbled-up goat’s cheese and a dash of balsamic vinegar, garnishing the ensemble with a single basil leaf. In total, it was probably no more than five minutes’ work to prepare both salads (and even less to eat them). There was enough to save a bit for this evening too and, while they weren’t in quite such good condition after a day in the fridge, they were still very tasty. Over the weekend I read Much Ado About Nothing for, as far as I can recall, the first time (although I did recently watch a film version of it, which is actually what prompted me to read it when I realised that I was unfamiliar with the story. He that hath a beard is more than a youth, and he that hath no beard is less than a man. Incidentally, I just went to add that to my list of favourite quotes on Facebook and discovered that this section of the Facebook profile seems to have been removed, or at least well-hidden. This goes to show, I suppose, that relying on an online medium such as Facebook (or, for that matter, a blog) for long-term archiving of information is probably not a very good idea. Fortunately I can remember most of the quotes I had on my Facebook page (which were there mostly to help me remember them), so I’ll probably include a few more of them in blog posts over the next few months (I’ve already blogged a few of them over the past couple of years). The film version of Much Ado that I referred to is one directed by Joss Whedon (the creator of my favourite TV series – Firefly – as well as other greats such as Dollhouse, Buffy the Vampire Slayer and Dr Horrible’s Sing-Along Blog) that was made a couple of years ago. I was keen to see it as I have enjoyed the aforementioned works of Whedon as well as Shakespeare. It was somewhat adapted from the original play but stayed fairly faithful to the plot and pretty much entirely, as far as I could gather, stuck to Shakespeare’s words (although the setting was modernised). It was filmed entirely in black & white, which worked pretty well, and featured several actors I recognised from Whedon’s other series, including Nathan Fillion and Sean Maher from Firefly and Amy Acker from Dollhouse (who was playing Beatrice – I’m not sure whether the beard quote was in the film but I think it was). It was slightly strange hearing Shakespeare pronounced with American accents although, in fact, these are probably just as close to authentic Shakespearean English pronunciation as modern British accents are (if not closer). The opening lines of Shakespeare’s Sonnet 18 have long been one of my favourite fragments of poetry, probably ever since the Darling Buds of May (which took its name from the end of line 3) was on TV in the early 1990s, although I never actually watched it at the time. When I re-read the sonnet the other day, I was particularly struck by the fourth line and I am trying to commit this (if not the rest of the sonnet) to memory so that I have a more balanced chunk available to recite when the occasion arises. Perhaps I can appreciate this line more fully now I live in Wales, where our summers tend to be rather brief (although last year was a very pleasant exception). Today has been one of those days that actually feels like summer. The afternoon was made especially pleasant by a visit from my brother and sister-in-law. We went for a nice walk along the cliffs near South Stack (just outside Holyhead), followed by a lovely dinner at the Marram Grass café in Newborough (the third time I’ve been there and the first when I’ve not been playing a gig). Sadly, like the fleeting summer, their visit was all too short. My recent musings on coffee, inspired by a line from T S Eliot’s The Love Song of J. Alfred Prufrock, reminded me of a poem I wrote on the subject a few years ago. All hail to thee, thou umber nectar sweet! But art the very finest of thy ilk. And helpst my sluggish brain once more to start. While thou dost warm my hands, my head, my heart. Who to thyself a slave dost of me make. For, should I not, my head begins to ache. And with thy kiss I am both blest and curst. Although not, I think, the original conscious intention, the use of the old-style language does help keep the tone of the poem light despite the fact that it is essentially about the subject of addiction. Trying to cast my mind back to the thought processes involved in writing a poem nearly 5 years ago is hard work, even fortified by the cup of coffee I’ve just finished, but I think the initial impetus to write it came from the epithet “umber nectar” to describe coffee, which sprang unbidden into my head (doubtless while I was drinking a cup of the same – or possibly when I was painting a picture of one; in case you’re unfamiliar with paint colours, burnt umber is a shade of dark brown quite similar to the colour of black coffee). Having come up with “umber nectar” and thinking it was a suitably poetic turn of phrase, I quickly decided to write a poem in praise of my favourite hot beverage. The line “(All) hail to thee, thou umber nectar sweet” followed fairly quickly, as I recall, and because that sounded faintly Shakespearean I decided to aim for a sonnet and use vaguely archaic sounding language throughout (although there’s certainly nothing intrinsic in the sonnet form that requires it). The poem grew more-or-less organically from beginning to end, as do most of my poems, and I didn’t have a clear end point in mind when I started it. According to my old notebooks, I nearly finished a first draft, then scrapped it and started again once I realised it wasn’t in iambic pentameter (the standard meter for a sonnet, at least of the Shakespearean variety). The rather abrupt switch from effusive praise to acknowledgement of the dangers of caffeine was beginning to take shape in the earlier version, although I didn’t get as far as the final couplet which brings the two strands together. I mentioned earlier the possibility that the “umber nectar” idea came while I was painting. 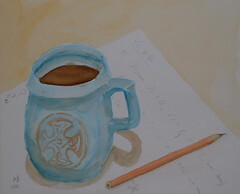 I have, as I recall, painted two coffee-related pictures (both, as it happens, using the same mug as a model) and, looking back at them, the dates make it unlikely that either was the direct source of the inspiration as one was completed several years before the poem and one a few months afterwards. You can follow the links (by clicking on the pictures) to see bigger images of these paintings on my Flickr page, and read the captions and comments if you want more information about them. This was probably hanging on my wall (as it is now) when I wrote the poem and may well have inspired (or helped to inspire) the poem even though I didn’t come up with the name when I was painting it (or at least, I don’t recall having held on to the “umber nectar” idea for 6 years – or even 6 hours – before turning it into a poem). Recently, I’ve been getting stuck into the poetry of T. S. Eliot. As I mentioned some time ago, his Old Possum’s Book of Practical Cats is one of my favourite works of poetry. It’s also the part of Eliot’s work that I know best, having read it many times. I own two printed copies, one with illustrations by Edward Gorey and the other (the standard Faber edition, I think) illustrated by Nicholas Bentley. Both are fine sets of illustrations (and the two are quite different in style from each other), which complement the poems nicely. I have also had a copy of Eliot’s Selected Poems (Faber, 1954) for a few years, although I don’t think I’ve read quite everything in there. This anthology, which was put together by Eliot himself, contains many, though not all, of the poems from his earlier published volumes. It includes The Wasteland, which is probably his most famous poem. Quite recently, I picked up an electronic copy of Eliot’s Complete Poems, mostly to get hold of Four Quartets (probably his second most famous work, which I particularly wanted to read after having read about it). I also got a couple of commentaries on his work, some of which is quite obscure and benefits from a bit of study to understand what it’s getting at (although it is perfectly possible to derive much enjoyment from it without picking up on all, or indeed any, of the references). Although I’ve mostly been reading my new electronic anthology (with a view to reading all of Eliot’s published poetry before too long), I have been dipping into my dead tree editions as well, mainly for the sheer tactile pleasure of handling real books. I discovered a couple of passages I had underlined in The Love Song of J. Alfred Prufrock, one of Eliot’s earlier poems (dating to around 1918, as I recall) and the source of the title of his first published anthology: Prufrock and Other Observations. Evidently these underlined passages were the bits which most leapt out at me on my first reading of the poem, several years ago, and they are still amongst my favourite bits of it. I’m not sure precisely what Eliot had in mind when he wrote that line but, as someone who drinks quite a lot of coffee (and rarely goes for as much as a whole day without at least one cup), I like the idea of somehow using coffee spoons (or rather, the cups of coffee that you make with their aid) as a measure of the passing of your life. 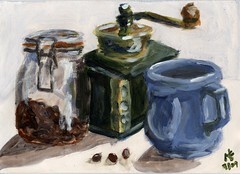 I have no idea how many cups of coffee I have actually consumed in my life. Based on a rough estimate of 2 cups per day for the last 25 years (since I was about 11), and assuming 365 days per year (i.e. ignoring leap years etc. ), it’s something like 18,250 cups. It’s not uncommon for me to only have one cup in a day (although, as I said, I rarely miss a day entirely) and I have been known to have a lot more than two cups, so I suspect that’s probably a fairly low estimate and it would probably be safe enough to round it up to 20,000. That’s something to ponder next time I’m lying awake at night. I would guess that the attendant lords in question are probably meant to represent Rosencrantz and Guildenstern (who were such minor characters that Tom Stoppard felt inspired to redress the balance by rewriting the Hamlet story from their perspective in his excellent play Rosencrantz and Guildenstern Are Dead). This passage is quite apt for someone who used to dream of being famous (and preferably also rich) but is now quite content to live in relative obscurity and does his best not to take himself too seriously. Not, of course, that I have anyone in particular in mind with that description. I have missed out a few lines from the middle of that second quote. If you like the bit I’ve quoted (or even if you don’t), I’d recommend reading the whole of The Love Song of J. Alfred Prufrock. This particular passage comes from quite near the end, while the coffee spoon one is near the middle (my edition doesn’t give line numbers and I can’t be bothered to count them). I’m mostly familiar with this one by virtue of having come across its Latin translation (“rosa rosa rosa est est“) in one of the books from Henry Beard’s Latin for all occasions series (I’m not sure which one). A swift bit of searching on my favourite free, online encyclopedia revealed that the original quote was from the poet Gertude Stein in her poem Sacred Emily. In its original form it appears as “Rose is a rose is a rose is a rose” (apparently Rose is a character in the poem, which I’ve not yet had a chance to read), although apparently the version I quoted earlier was also used by Gertrude Stein. According to the Wikipedia article, “In Stein’s view, the sentence expresses the fact that simply using the name of a thing already invokes the imagery and emotions associated with it”. This is apparently the diametric opposite of Juliet’s view (I was going to say “Shakespeare’s view”, but it’s not necessarily true – or indeed (probably) necessarily not true – that he agreed with everything he made his characters say). However, I think there is at least a grain of truth in both ideas. The Wikipedia article also states (and I see no reason to disbelieve it, although it didn’t cite sources for these claims) that Stein’s quote was an inspiration for (the name and possibly the existence of) Umberto Eco’s novel The Name of the Rose and that Ernest Hemmingway once parodied the quote as “a stone is a stein is a rock is a boulder is a pebble.” The article goes on to list quite a few other variations on the theme. God gave us our memories so that we might have roses in December.